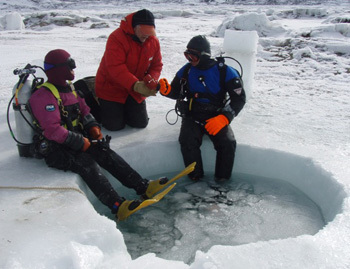 Master divers Steve Clabuesch and Cecilia Shin will discuss diving beneath the ice in Antarctica in a public lecture at the Seymour Center at 1 p.m. on Sunday, March 20. Their talk, "Beneath the Antarctic Ice," is part of the Science Sunday lecture series at the Seymour Center at Long Marine Laboratory. The event is free with paid admission or membership. Clabuesch has been the diving safety officer at UC Santa Cruz for the past 10 years and has participated in three research expeditions to Antarctica. Shin, who heads UCSC's Recreational Scuba Program, joined him on two of those expeditions, helping to expand scientific knowledge of this faraway environment. Recent expeditions to the Antarctic are opening windows to a previously unknown world, adding to our basic understanding of the region, setting baselines for science, and capturing the imagination. Getting into the water at the southern end of the world takes preparation and courage. Clabuesch and Shin will discuss what it takes to become a scientific diver and describe the challenges and rewards of discovering and documenting one of the last areas of exploration on earth. Join them on a scientific journey beneath the Antarctic ice--from mapping out the science, developing the logistics, creating the dive hole, and, finally, getting into the water at one of the most remote parts of the planet.